The best-loved fruits, vegetables, nuts, and specialty seeds are combined into a nutritious, gourmet diet for macaws, cockatoos, amazon parrots, african parrots, eclectus, pionus and large conures. 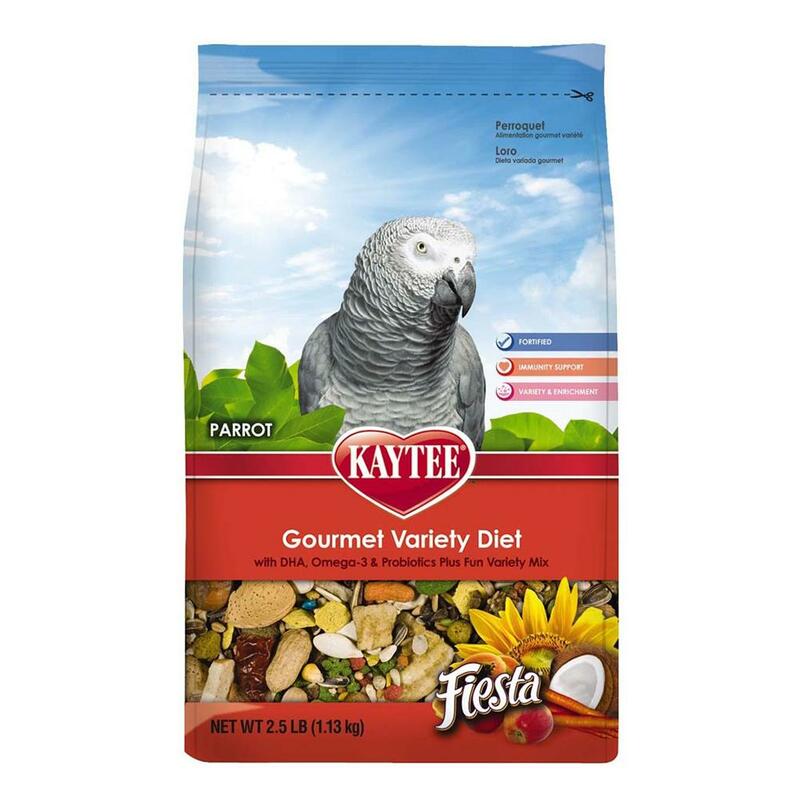 Fiesta was developed by the nutritional experts at the Kaytee Avian Research Center to supply all the nutrients proven necessary for excellent health. The wide variety of colorful shapes, sizes and textures makes eating more fun for playful birds. Ingredients: Pumpkin Seed, Safflower, Almonds, Corn, Ground Corn, Sunflower, Whole Peanuts, Toasted Corn Flakes, Oat Groats, Wheat, Cantaloupe Seed, Raisins, Dried Bananas, Green Split Peas, Ground Wheat, Oyster Shell, Buckwheat, Milo, Corn Gluten Meal, Dried Papaya, Shelled Peanuts, Squash Seed, Pinto Beans, White Northern Beans, Pistachios, Filberts, Dehydrated Carrots, Dried Pineapple, Dried Red Peppers, Coconut, Dehydrated Sweet Potatoes, Pinenuts, Dehydrated Apples, Dehulled Soybean Meal, Wheat Middlings, Dehydrated Alfalfa Meal, Dicalcium Phosphate, Corn Oil, Calcium Carbonate, Wheat Germ Meal, Corn Sugar, Ground Oats, Dried Beet Pulp, Dried Whole Egg, Salt, Brewers Dried Yeast, Vitamin A Supplement, Choline Chloride, L-Lysine, Dried Cane Molasses, DL-Methionine, Vitamin E Supplement, Vitamin B12 Supplement, Riboflavin Supplement, Potassium Sulfate, Ferrous Carbonate, Zinc Oxide, Manganous Oxide, Menadione Sodium Bisulfite Complex (source of vitamin K activity), Niacin, Calcium Pantothenate, Ethoxyquin (a preservative), Orange Oil, Copper Oxide, Pyridoxine Hydrochloride, Cholecalciferol (source of vitamin D3), Thiamine Mononitrate, Folic Acid, Canthaxanthin, Calcium Iodate, Cobalt Carbonate, Biotin, Dried Bacillus coagulans Fermentation Product, Dried Bacillus licheniformis Fermentation Product, Dried Bacillus subtilis Fermentation Product, Beta-Carotene, Sodium Selenite, Artificial Color.